Vanilla is everywhere! From air fresheners to dryer sheets, detergents to perfumes, vanilla has cornered the market on scent. Its alluring and calming fragrance conjures notions of comfort and rest. But it is the taste of vanilla that has dazzled the human species for more than a thousand years. Vanilla is the fruit of an orchid, making it one of the scarcest creations in nature and one of the most expensive spices on earth. (It is second in value only to saffron.) Its scarcity, though, is not reflected in its popularity. Vanilla ice cream, for instance, is by far the most popular flavour, outselling chocolate, three to one. Used in thousands of desserts and meals across the globe, it is almost indispensable to cookery. Naturally, or perhaps unnaturally, most of the world's vanilla flavouring is artificial. Synthetic vanilla was developed in Germany in the 1870s to offset the expensive cost of natural vanilla. It contains only one natural ingredient, vanillin, which was first extracted from coniferin, a compound found in evergreen trees. Soon after, a method was developed to extract vanillin from cloves. Contrast this one ingredient with the 171 identified flavouring compounds found in natural vanilla and you'll understand the push to use the natural over the artificial. Vanilla is a New World discovery, hauled out of its Aztec niche by the Spanish explorers, who also discovered chocolate in Aztec culture. So rare was the vanilla bean at the time that the Aztecs actually used it as currency. Batches of the bean pods were reserved for the nobility, who considered it an aphrodisiac. Vanilla’s rarity can be attributed to its natural development. 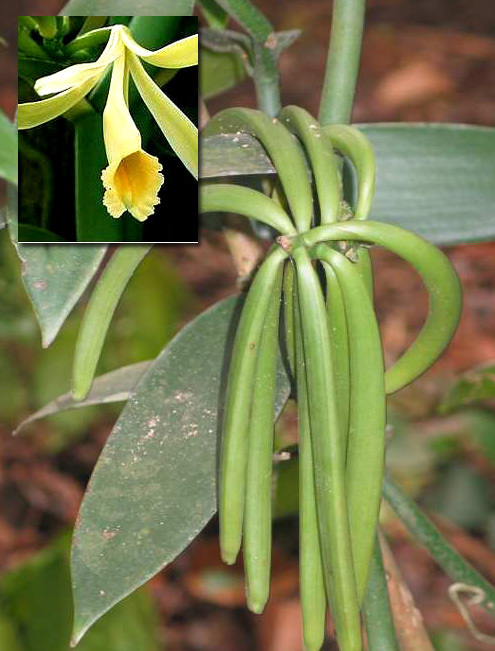 The orchids that bear the vanilla bean only grow naturally in the equatorial regions of South and Central America. Its pollination process, too, is singularly specific; a tough membrane separating the flower’s male and female reproductive components prevents the orchid from being pollinated too frequently. Only one species of bee and one species of hummingbird had evolved the ability to penetrate the membrane. It wasn’t until 1836, more than three centuries after vanilla was brought to Europe, that the proliferation of vanilla began. Botonists realized the orchids had to be hand-pollinated, one small flower at a time, a process discovered by Belgian botanist Charles Morren and a young French slave named Edmond Albius. The method involves lifting the membrane out of the way and gently rubbing the anther and the stigma together. On vanilla plantations around the equator, workers still pollinate up to 2000 flowers a day using this method. Their window of opportunity is small since the flowers only bloom at sunrise. If they are not pollinated, the flower will wither and die and the chance at pollination is lost. Once pollinated, the bean pods can take up to nine months to develop. The beans are then hand-picked during a one-month harvest period. When picked, the beans are completely odourless and tasteless. Releasing that characteristic flavour takes months of labour. First, the pods are killed by being soaked in hot water. Then, every day for three or four months, they are placed in the sun to dry. Each night, they are rolled into blankets to sweat. For several months after that, they are left to cure in large wooden crates. At this point, the beans are nearly black in colour and have withered to nearly one quarter their original weight. Most of these beans are destined for factories where their juices will be extracted and bottled: pure vanilla extract results. Some are shipped, as is, to specialty stores around the world. An individual vanilla bean can cost anywhere between $2 and $6, depending on the quality and your location on the planet. They are often difficult to find but the search is always worth it. The flavour from a natural vanilla bean (and the multitude of tiny seeds contained within) is gloriously intense and rich. Making your own vanilla extract with the beans is quite simple, and makes an excellent gift. Choose premium beans that are flexible, not brittle, have a rich vanilla aroma and are oily to the touch. The best beans, which are used in bourbon, have a white ‘frost’ of pure vanillin on the outside, which will sparkle under light. To make the extract, split four to six vanilla beans in half, lengthwise, with a sharp knife and add to a half bottle (374 ml) of vodka or grain alcohol. Store at room temperature (never refrigerate vanilla) in a dark place and wait. Two months is the bare minimum, six months is even better. Sealed vanilla extract, like good wine, only improves with age. You can leave the beans in the bottle and top it up with fresh spirits as you use it. Alas, in taste tests conducted by Cook's Illustrated, blindfolded tasters preferred vanillin over vanilla. Are these the sort of US'ers who prefer burnt-roasted Starbucks coffee (burning it assures its McDonald's-like regularity across the planet - outside of Italy, grazie tante)? The one who in transoceanic travel preferred plank steaks to lobster thermidor? The American palate is mess. I do not know, but I feel vanilla, which is rather more expensive than vanillin, need not have such snobby cachet as mouthed by Martha and others. Unsalted butter is one thing (and chemically sound in bakery), but our exotic orchid need not be queen of the kitchen. Vanilla extract is also an alcohol-based liquid for those eschewing alcohol. Vanillin is also an organic compound, derived not only from the vanilla pod where, after weeks of curing (via drying and sweating many times), its molecule is released, but also from petrochemicals and the byproducts of wood manufacturing. We use vanillin, but won't snub vanilla; both are seldom used by me these days. Few I know bother with a simple vanila bean, always a fun thing to open and scrape. As for vanilla's permeation into the realm of room deodorizers, fabric products, and especially candles, I am all against this trend. I never like things that smell like food to not be food, especially since odors of vanilla, apples & cinnamon, etc., are likely to excite my cravings for such foods as pies and palmiers. Also, such meories of fake food smells detract from my enjoyment of the foods themselves. Some olfactory boundries oughtn't be crossed. However, as a boy I did so want someone to invent a room spray that smelt of barbecue T-bone steak! Hmmm!!! Ah!... "Frederic Francine Fishpaw"